Endurance.Net: Consider this...: Will the new laws for hauling horses affect you? Will the new laws for hauling horses affect you? 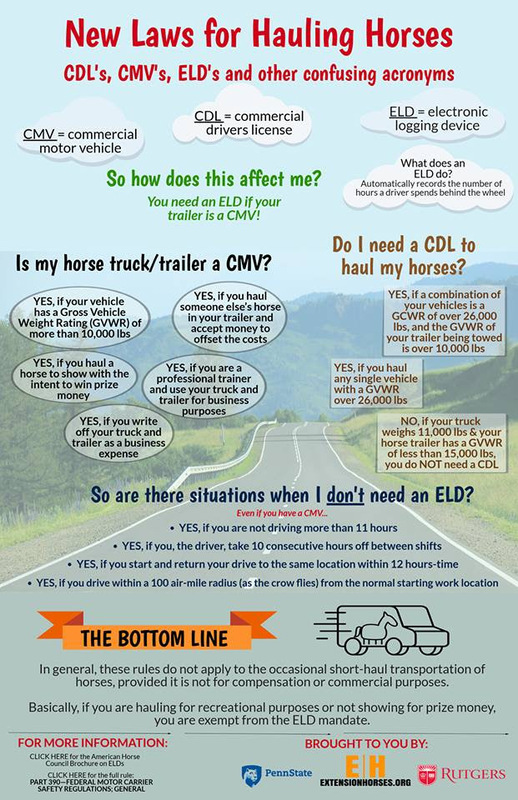 Is your truck/trailer a CMV (Commercial Motor Vehicle)? Do you need a CDL (Commercial Drivers License) to haul your horses? If so, you will need an ELD (Electronic Logging Device). In an effort to help provide clarity to the ELD Mandate that was previously set to go into effect December 18, 2017- the AHC has put together two brochures to help provide insight into this already complex issue. Is Sugar Beet Pulp Too High in Sugar for Horses? Why is the Frog of My Horse's Foot Falling Off? Should I Feed Alfalfa Between Endurance Races?